Memorial site for Judy Frankel with links to everything. Harmony Ridge Music Publishers: Judy Frankel CDs. See also bio hosted by the label. "Short Bibliography of Sephardic Music"
"[An Introduction to] Sephardic Song", Magshamon #25, WZO. Like so many other people in the Jewish music world, and beyond it, I was astonished, before disbelief gave way to sadness, to read a brief note, in a Ladino discussion group, about the death of Judy Frankel, on March 20, 2008, at age 65. She left no immediate family, but many friends who had become her family over the years. A gentle, gracious and discreet person, she had, I learned a little later, not told many people besides her close friends about her illness, cancer. I met Judy in person only once, in the 1990s, when my old group Gerineldo was singing in San Francisco, and, after having corresponded several times, we met at her home in San Francisco. After that delightful afternoon of conversation and tea, we corresponded sporadically,and in 2005, when Tamar, my daughter, and I sang for the Berkeley Jewish Music Festival, Judy and I were looking forward to meeting again—but we didn't. Judy said regretfully that she was ill and wouldn't be able to meet with me. At the time, I assumed it was a late winter 'flu, which was "going around". Gentleness (not to be confused with lack of strength) and sincerity are two impressions of Judy which have remained with me since that first and, sadly, only visit. One thing we shared, and talked about, besides the name (several people wanted to do a "Three Judy's" concert, Judy Wachs of "Voice of the Turtle" as the other J., but it never came about) was a background in medieval and renaissance music. Judy studied at the Berklee School of Music, Boston University and Harvard, and had master classes with luminaries of the Early Music movement, including Andrea von Ramm and Emma Kirkby. After moving to the Bay area in 1969, she sang with many small and large ensembles, including the San Francisco Symphony Chorus, and was a soloist with several, among them the San Francisco Consort. 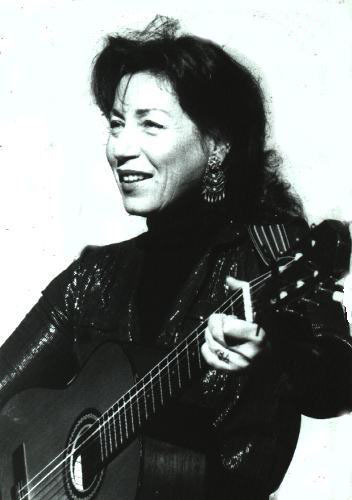 As a solo performer, she sang not only the Ladino / Judeo-Spanish songs most of us know her for, but also Yiddish, Hebrew, and songs in a total of some twenty languages—garnering frequent appreciative comments on her good pronunciation. Besides her four solo albums, and book of songs, Judy was included, along with Aretha Franklin, Patsy Cline and Ani di Franco in the "Divas" compilation on Rounder Records. She was an accomplished guitarist, and, not so well-known perhaps, is her earlier work, in Boston in the 1960s, in folk, blues and rock. She performed alongside Joan Baez and Tim Hardin, and fronted the group Ill Winds (formerly Prophet), with Ken Frankel and others. The clips I've heard show her characteristic clear, flexible, but unpretentious singing, as well as her guitar playing and—early programmable drum machine, with her foot. Many of talk about "collecting" songs. Judy didn't. She talked, with never-failing appreciation and affection, of "harvesting" songs, and always credited the people she learned them from. The people—not musical transcriptions or second-hand recordings. Judy was one of the first (and still, regrettably, one of the few) singers of Sephardic songs who, from the beginning, learned songs directly from the people whose tradition it was. Those who have seen the film "Trees Cry for Rain" will remember how carefully she learned from Rachel Bortnick, founder (later on) of the listserv "Ladinokomunita". A capable researcher, Judy did good background research, but understood that, unlike early music, where all we have are manuscripts, traditional singing is really only properly learned from the traditional singers. Working with these Sephardic women meant, as she told me when we met, that she sang mostly their repertoire, the majority of which was the lyric song repertoire, rather than the old narrative ballads and wedding songs which this generation of women rarely sang by this time, and in the style they used, which by then was mostly Western tempered intervals, rarely if ever in the old maqam style. She made this style her own, in an artistically admirable, but never pretentious way which appealed to and inspired both the Sephardim themselves and to people who had rarely or never heard the songs before. Women in Sephardic communities, especially in California, where she lived, welcomed her as a friend, as adopted family—as "Sephardic by choice". Judy also did volunteer work, especially helping Crypto-Jews in the American southwest regain their Jewish heritage. She travelled to Portugal to meet with the Crypto-Jews in 1989, and in 1994 went to Macau and spoke with East Timor refugees, learning a song about peace from one of them, a song she subsequently sang in Lisbon, for an audience which included the then president of Portugal. In Judy's own words (see Sion, below) "Our large Jewish community in the world is like a bouquet and every smaller community is a flower. It is not a competition, it is a cornucopia." Thanks to Judy Frankel for this lovely image and for the many beautiful flowers she added to it. Sent to the KlezmerShack by Judith Cohen on 30-Mar-2008. Email Judith Cohen, who also thanks Rachel Bortnick, Anne Treseder, and Jean Carasso for information used in this remembrance. Copyright © 2008 Judith R. Cohen. All rights reserved. Used with Permission. This page is maintained by Ari Davidow. Send me E-mail with any comments or suggestions. All rights reserved. Last revised 29 June, 2008.